Welcome to 2 Kings chapter 23 summary. 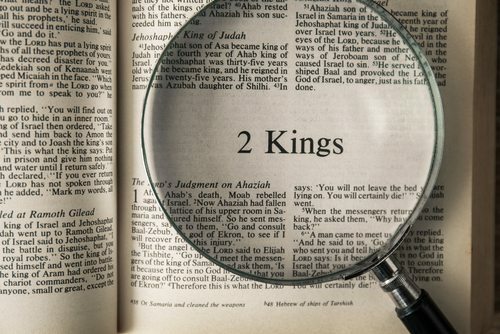 Chapter 23 of the second book of Kings began with king Josiah and his reaction to the book of the law. The book of the Law was found (in the previous chapter) by the high priest Hilkiah. Josiah brought the elders and leaders of Jerusalem together to learn of the reformation he would implement nationwide. He first gathered all the people of Judah for the reading of the book of the law. The people and the leaders all agreed to keep the covenant mentioned in the law as they did during the days of Moses. After this meeting and agreement to keep the covenant of the LORD, a huge major reformation was implemented across the land. Josiah destroyed anything and anyone who was against the Sovereign LORD God of Israel. He destroyed images of other gods, places of worship, sacrificial altars to Baal and Asherah. He destroyed temples, breaking into pieces these idols, then grinding them into powder. Josiah tore down buildings, temples, and anything that offended the God of Israel. He destroyed priests of other gods, he dug the bones of idol worshippers who were deceased; and ground their bones to powder. The king was quite zealous. He did this in Samaria as well as in Judah. After he was done, he implemented the first Passover head for both Judah and Israel that was performed in the manner performed in the days of Moses and the judges of Israel. With all this, the LORD was pleased with him and his acts, but not with the people of Judah. He still decided to remove them from the land (in the next few generations). The LORD would keep his promise to Josiah, which called for him not to see the destruction of Judah and Jerusalem. However, Josiah meddled in a battle and the king of Egypt had him killed for it. His son Jehoahaz replaced him but was demoted and arrested after three months in power. The king of Egypt promoted Josiah’s other son, Eliakim, whom the Pharaoh changed his name to Jehoiakim, and made him king of Judah. The twenty-five-year-old ruler ruled eleven evil years in Jerusalem. This is the summary of 2 Kings chapter 23, glory to the Holy One of Israel.